Since we launched Chromebooks this summer, it’s been exciting to hear how students are using Chromebooks to collaborate and create in the classroom. In the spirit of letting our customers speak for themselves, we wanted to share stories from three of the newest schools using Chromebooks in their classrooms, libraries and to provide Internet access to students at home using built-in 3G. The Renaissance Academy Charter School in Nevada virtually serves students from low-income families across 13 counties in the state. The Academy’s mission is to free students from perceived limitations on their performance, and to narrow the achievement gap through technology. Roy Harden, administrator, jumped at the opportunity to deploy Chromebooks to their 490 students and staff. “We promised our students and parents a protected environment for their computing needs, which the Chromebook - with forced proxy settings and content control - allows us to uphold. With 3G connectivity, the Chromebook also gives access to our students who typically do not have an Internet connection at home. We couldn’t ask for a better solution,” he said. The new features in the web-based administrator’s management panel will also help Harden better manage different age groups of students, teachers and staff, and these features will greatly improve his visibility into devices distributed across the state. The Oregon School District in Wisconsin has led the state in adoption of modern technologies in the classroom. As technology director and a former teacher himself, Jon Tanner understands how important it is to provide web access for all students while keeping costs low. This is why he decided to bring Chromebooks to 22 third graders at Prairie View Elementary School. Shannon Luehmann, the teacher whose class is using the Chromebooks, notes, "It was like Christmas morning in my class when I shared the news with the kids and let them open the Chromebooks. Some student reactions were, 'So, you're telling me this is mine to use all year? ', and 'We are going to do some pretty cool things with these computers this year!'" 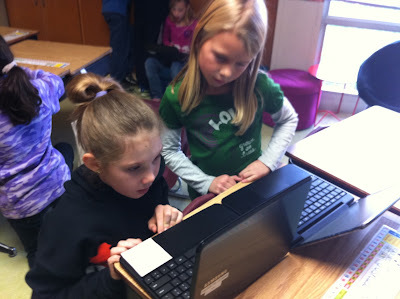 What can Chromebooks in the classroom do for your school? Learn more about Chromebooks for Education on our website. You can also join us for the Chromebook Classroom webinar series, Wednesdays at 9AM PT/12PM ET. Register here.